Bemka.com. If you’re a sushi fan, you’ve seen tobiko (also spelled tobikko). They’re the tiny, crunchy, nutty beads of flying fish roe. They’re served in a gunkan-maki (battleship roll), on uramaki (reverse rolls) and as a sashimi garnish. Originally available in orange, the popularity of tobiko has led to a rainbow of options: flavored tobiko in black (colored with squid ink), green (wasabi), pale yellow (yuzu) and red (ume plum), as well as spicy orange. Even smaller than tobiko eggs is masago, called capelin roe or smelt roe in English. You’ll also find the larger, more flavorful and pricier ikura, salmon roe. 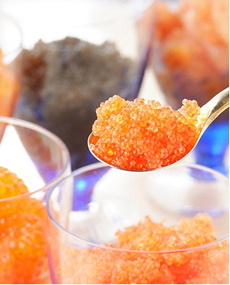 Tobiko caviar comes from the flying fish of Iceland and the Pacific Ocean. It’s available at better supermarkets, at specialty food stores and online. So for special occasions, pick up a jar. You’ll get a lot of bang (or is that crunch) for the buck. Check out other types of caviar in our Caviar Glossary.